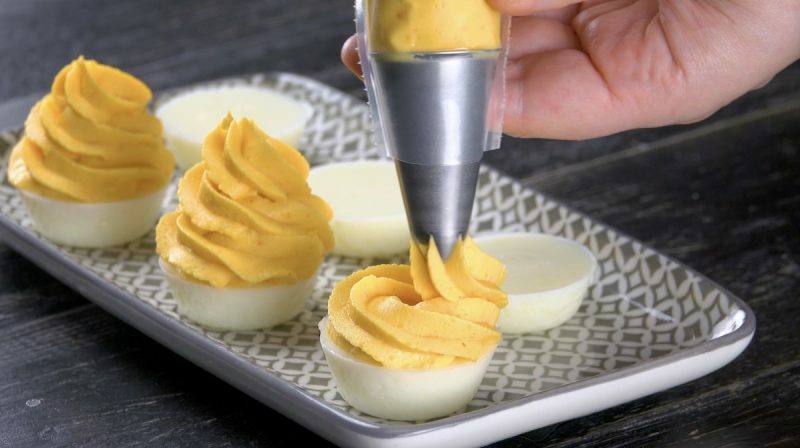 Deviled eggs are the perfect hors d'oeuvre to serve before a meal, as well as a great snack food to bring along to any tailgate party, cookout, picnic, potluck, or casual get-together. The only annoying thing about them? All the peeling involved after you've boiled the eggs! You'll love how easy this recipe makes your kitchen prep – say goodbye to boiling and peeling each and every single egg and wave hello to a nice and easy method that you can just pop right in the oven! 1. 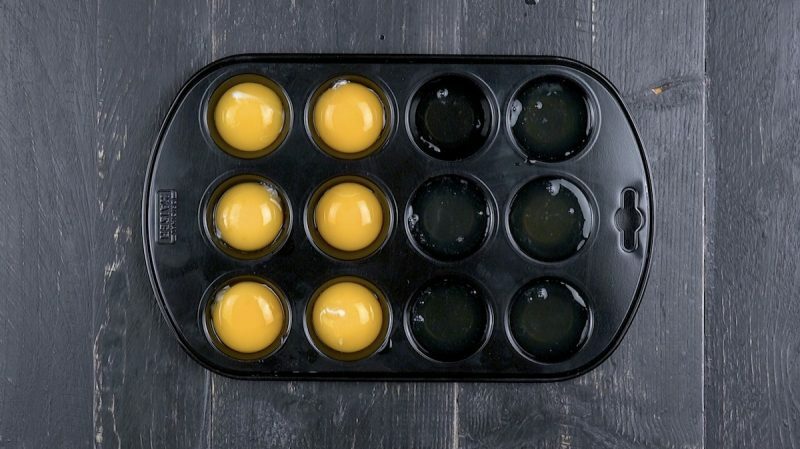 Preheat the oven to 300°F and grease a 12-cup muffin pan. 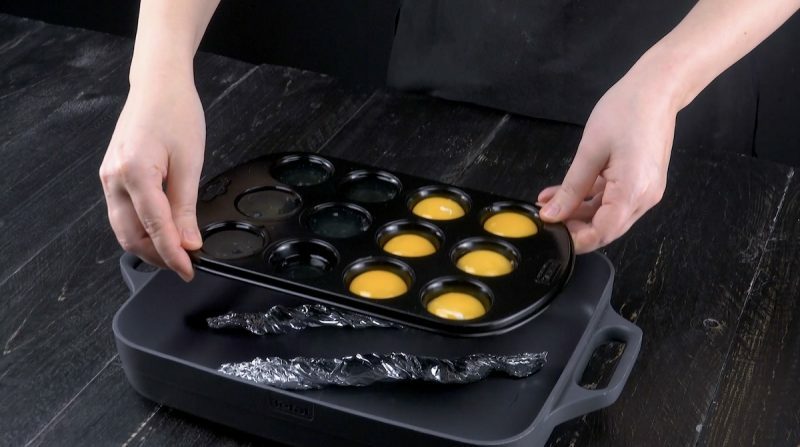 Separate the eggs so that 6 of the muffin cups are filled with egg yolks and the other 6 muffin cups are filled with egg whites. 2. Twist 2 pieces of aluminum foil and place them diagonally in a deep casserole dish that is slightly larger than the muffin pan. 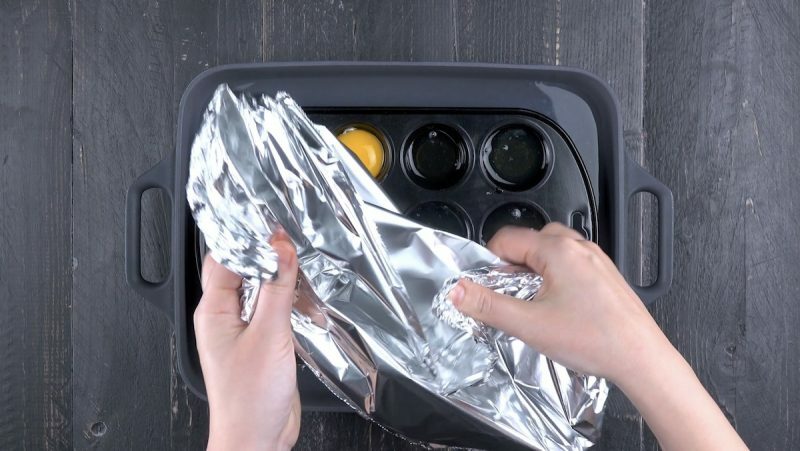 Place the muffin pan on top of the aluminum foil strips. 3. Fill the casserole dish with water and cover the top of the dish with another sheet of aluminum foil. Bake for 13 minutes. 4. 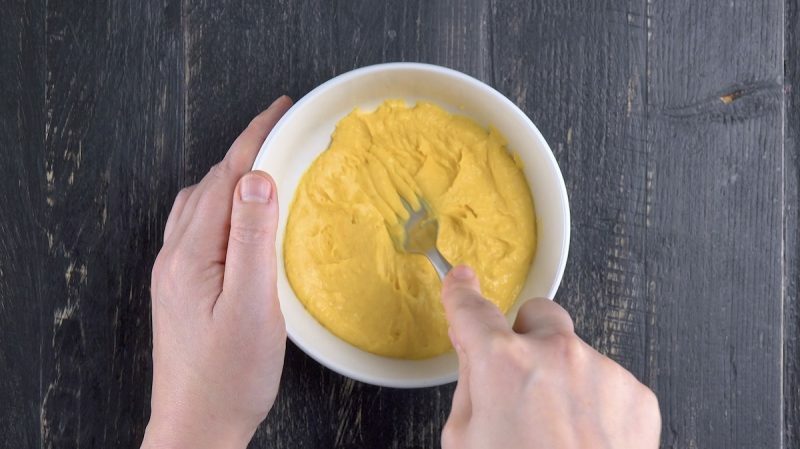 Combine the chili mustard deviled egg ingredients and stir until smooth. 5. Pour the mixture into a piping bag and decorate 3 of the egg whites. 6. 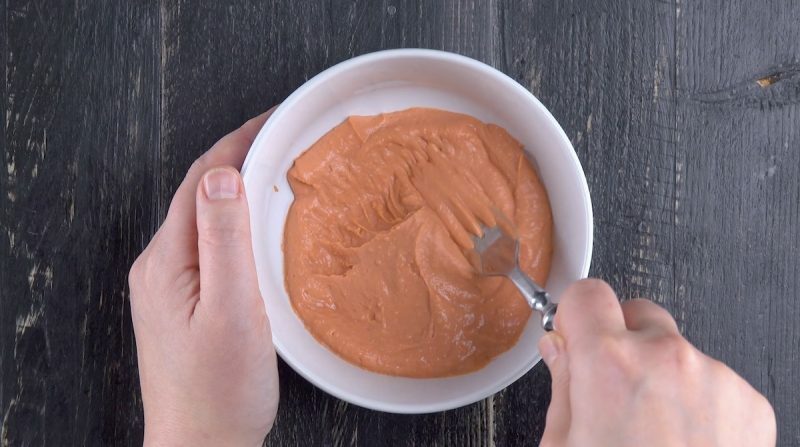 Combine the beet deviled egg ingredients and stir until smooth. 7. Pour the mixture into a piping bag and decorate the 3 remaining egg whites. 8. 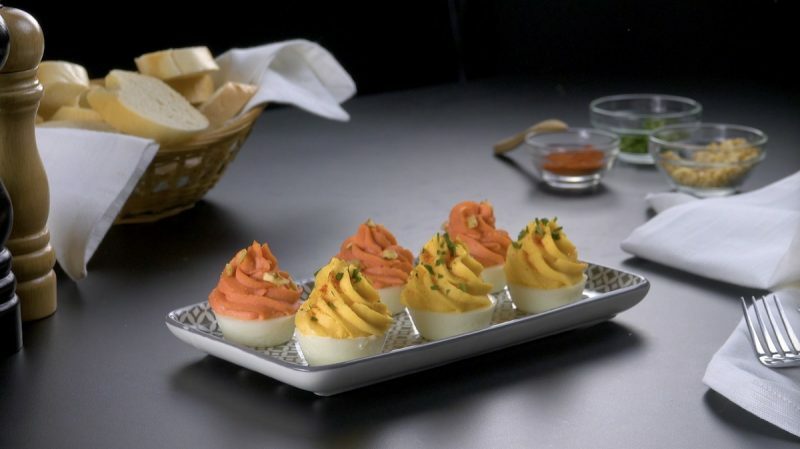 Garnish the chili mustard deviled eggs with paprika and parsley. Garnish the beet deviled eggs with chopped walnuts. 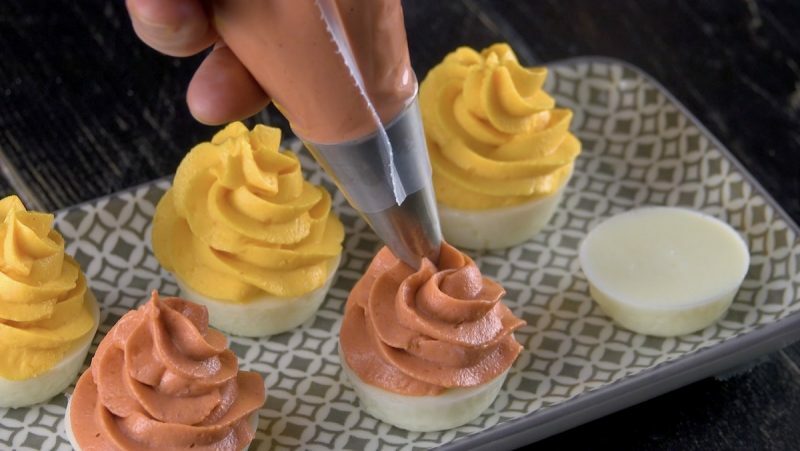 Everyone uses the same old boring recipe to make their deviled eggs – these creative and tasty recipes will be a breath of fresh air at your next gathering! You can find the recipe for the Fried Deviled Eggs featured in the bonus video here.